Nannari is called the Indian Sarsaparilla, it is not true Sarasaparilla which is Smilaz ornata. The root of Sarasparilla was sold as a tonic syrup in the early part of this century in many drugstores in the US. 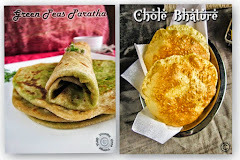 In India, most Nannari sherbets which are commercially available are made with artificial flavoring ingredients. When buying from stores you need to ensure that it is made from the real root. This is an extremely healthy alternatives to sodas for younger kids and adults. 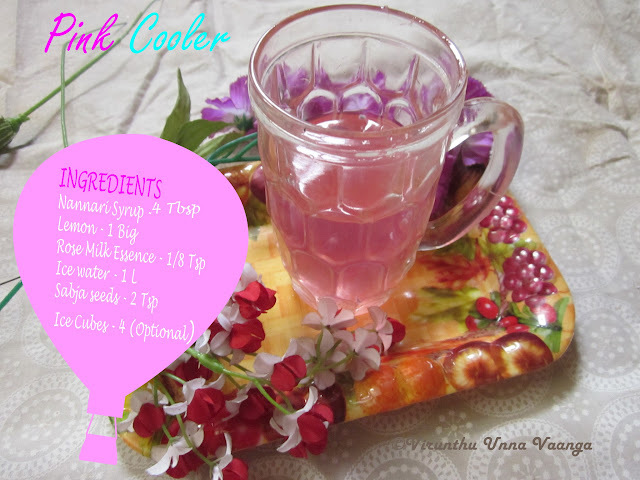 Nannari sherbet is a great body temperature coolant medicine in hot summer. Its an anti-heating agent for human body. Helps in controlling burning sensation in stomach, all kinds of skin diseases, fever and increase in body temperature due to hot summer. Seeds provide concentrated nutrition and fiber. All the ingredients needed for plant germination are present in the seed, including carbohydrates, vitamins, minerals and fat. Many seeds provide nutrition, flavor n texture in a balancing diet... 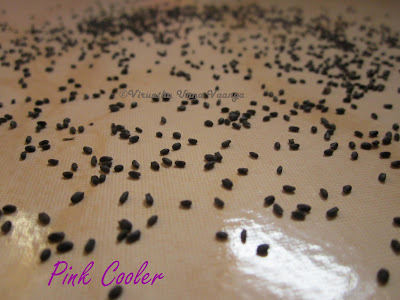 The gelatinous texture of the swollen basil seeds makes a filling drink. 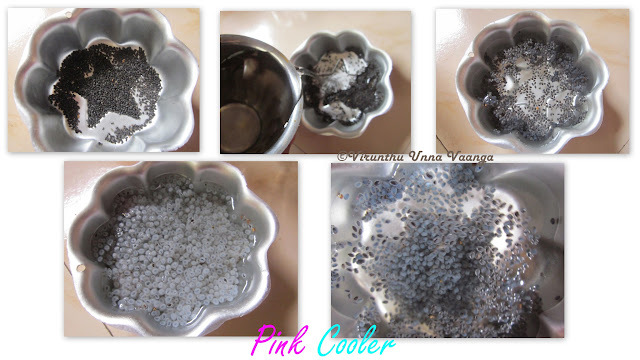 Take a small bowl add sabja seeds with 100 ml of water and let it soak for 10 minutes. 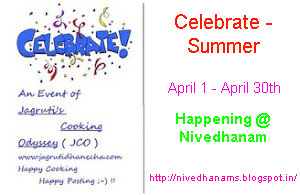 Now cut the lemon n squeeze the juice into the another big mixing bowl. 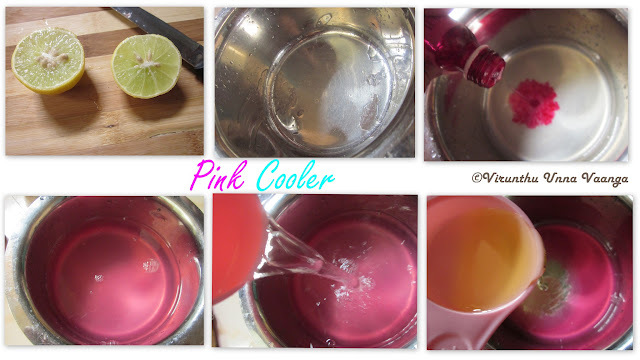 Add rose milk essence and add Nannari syrup to mix it once. 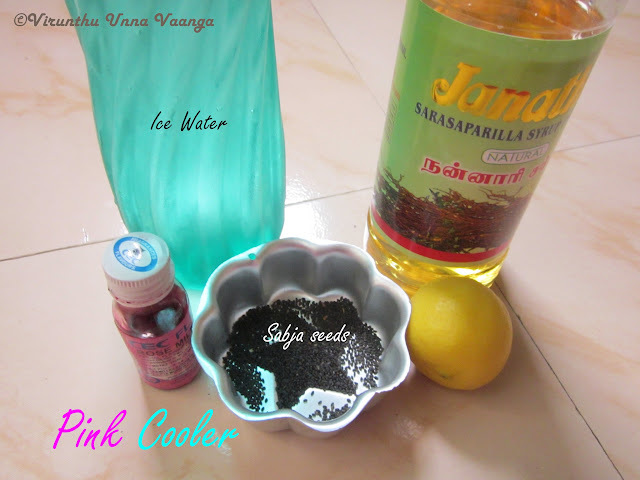 Now add required ice water according to your sweet taste. 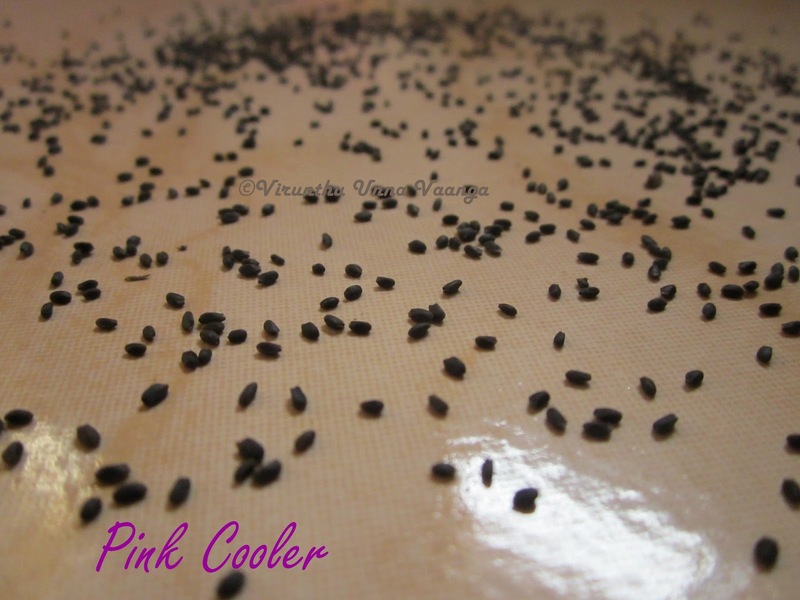 Take a serving glass put 1 Tbsp of Sabja seeds and add the pink sherbet to the glass. 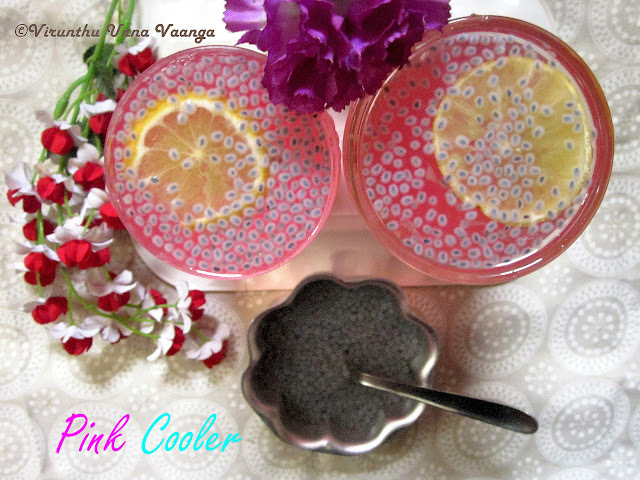 ENJOY THE CHILLED PINK COOLER WITH NANNARI N SABJA SEEDS!!! lovely clicks.quite refreshing for the summer. 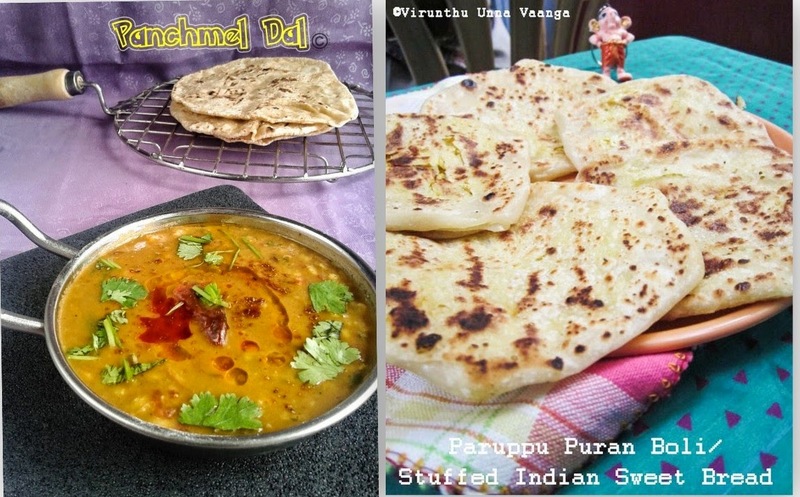 i was wondering where i can find Nannari ?? Wow! Nice presentation and looks very refreshing and relaxing..
An excellent body cooler to beat the heat,very catchy drink sis. 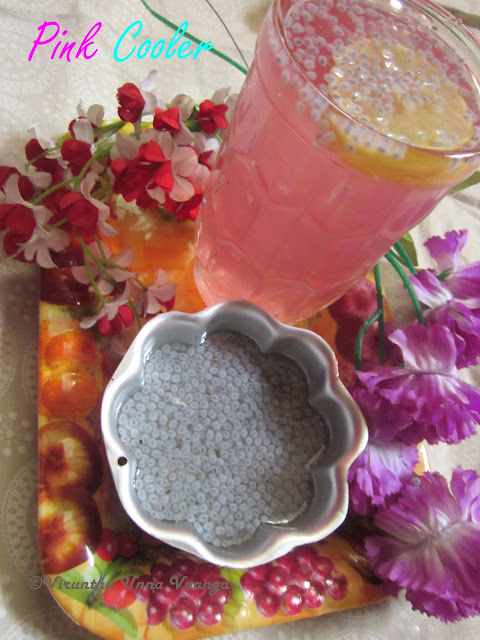 Sabja seed is tempting me more,wish i could find it here...yummy drink!!! 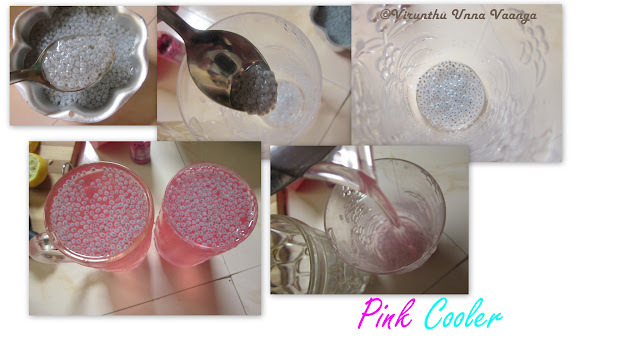 beautiful color da :) very refreshing drink for our hot summer..
What a lovely combination. 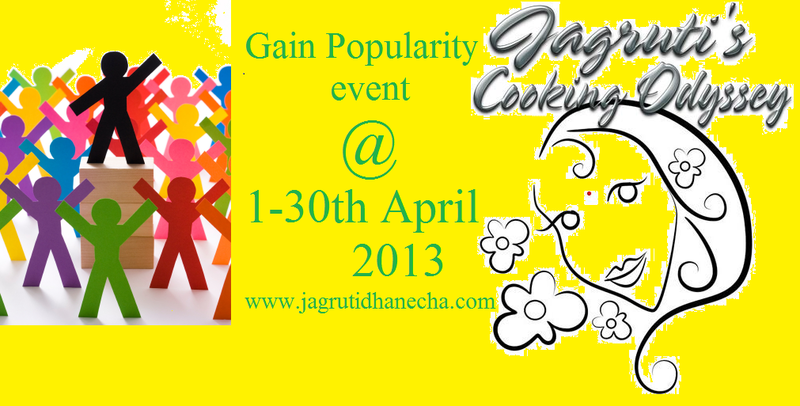 I hope we ge tthe Sabja seeds in the Indian grocery here. I am curious about the pink colour though? 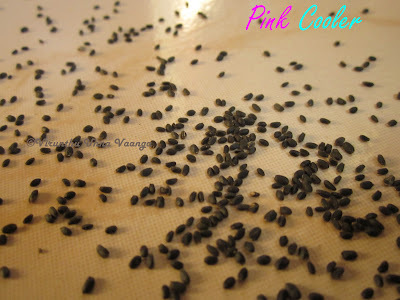 I love the beautiful pink with the sabja seeds. Double refreshing. 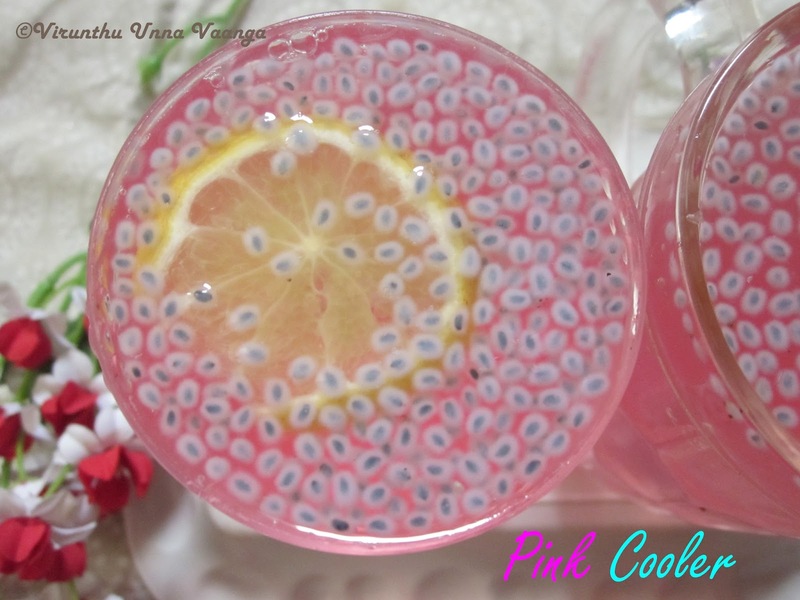 Lovely pink coloured drink..looks cool. Totally missing this nannri syrup and adding subja seeds sounds interesting.. Very refreshing cooler, loved the colour.....wow. But I could not get this seeds here, in local market. 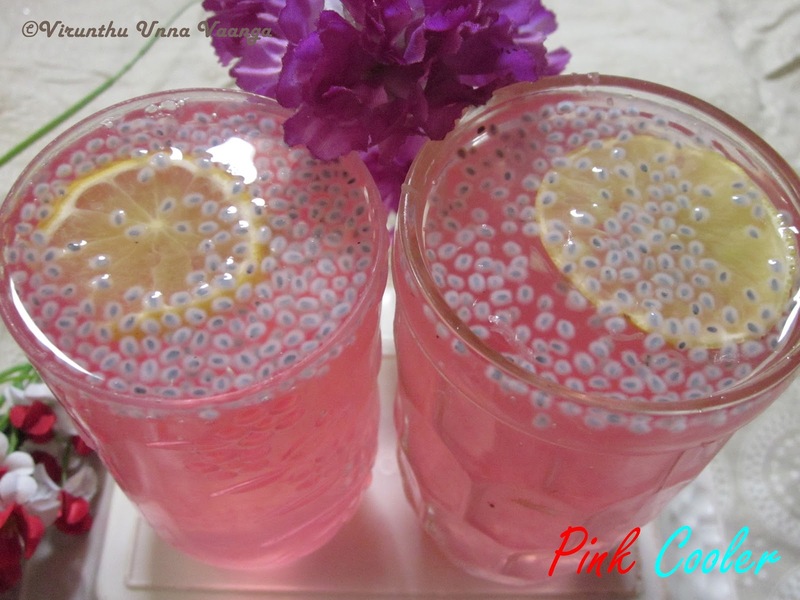 I love sabja seeds, pink color and the nannari drink so triple likes :) Looks so sooooooo refreshing Viji :) Veetuku vandha 2ndu glass venum ok va? Thanks for linking a cooler recipe from archives.